The first recorded miracle of Jesus was to change water into wine at the wedding feast in Cana – illustrating his gift to create change and transformation. The Bashaw United Church is introducing a fun game that uses wine as a way to support local programming and facilities, such as the Bashaw Community Theatre, Youth and Children’s programs and events, and the Community Kitchen, for example. 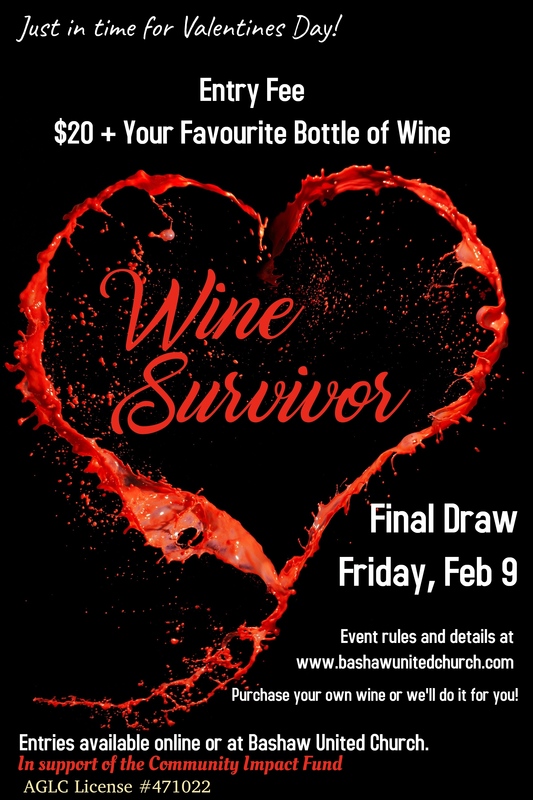 Wine Survivor is not only your opportunity to take home some wine but more importantly, to help the United Church support the programming that makes a difference in the Bashaw community. 1. Purchase a $20 ticket and bring a bottle of wine costing $15 or more to the church OR purchase a $35 ticket and we’ll buy the bottle of wine on your behalf. 2. Beginning February 05, 2018, we’ll randomly remove people from the island (through a reverse draw) until there are only three survivors left at 9:00 p.m. on February 09, 2018. The final survivor takes home 50% of the wine, the second place survivor takes home 30% and the third place takes home 20% of the wine! You can increase your chances of taking home some wine by forming an alliance! As long as one person in your alliance is in the final three, your alliance splits the bottles of wine to take home. To form an alliance, come up with an alliance name and have everyone in the alliance use the same alliance name when registering. You can purchase as many tickets as you’d like – each gives you another entry. You may also join multiple alliances although each ticket can only be tied to one alliance. On the final night, February 9, 2018 we will host an event where we will be kicking people off the island at 8:15, 8:30, 8:45 and announcing the FINAL SURVIVOR at 9:00 p.m.
A maximum of 250 entries will be accepted until February 08, 2018 (the Entry Period). Entry fee is $20 cash plus a bottle of wine with a minimum price of $15. Please take your bottle of wine to the Bashaw United Church any Thursday or Friday between 9:00 – 12:00 noon. You may enter the contest online or by contacting a member of the Bashaw United Church. Additionally, you may purchase a $35 entry fee and we will purchase the wine on your behalf. The amount of wine to be won will be determined based on the number of entrants who purchase entry tickets during the Entry Period. a. Elimination Round One: Monday February 05, 2018 at 1 p.m.
b. Elimination Round Two: Wednesday February 07, 2018 at 1 p.m.
c. Final Elimination Round: Friday February 09, 2018 completed at 9 p.m.
Bashaw United Church will publish eliminated and winning ticket numbers on our Facebook page. Click Here or Search Facebook for “Bashaw United Church”. The three winning entries will be notified by a phone call to the phone number registered on the entry ticket and by one email to the email address registered on the ticket entry. The wine will be delivered to the 1st, 2nd and 3rd place winners as long as the winners live within a 50 km radius of Bashaw. The winner will be responsible for shipping charges otherwise. The Wine Survivor Raffle is being conducted under AGLC licence #471022.